We are looking at CLL and MM cell signalling patterns and growth responses in a high-throughput format in collaboration with Dept. of Hematology (Prof. Tjønnfjord) and Dept. of Immunology (Prof. Munthe). Cancer drug sensitivity screening (CDSS) with a panel of 516 cancer drugs is now established based on the assay development with the aim to support screening directly on patient samples to assist therapy choices in individualized or tailored medicine. Ultimately, we wish to have algorithms to predict effective therapy combinations to be tested in individualized clinical trials. We are starting CDSS projects also in lymphoma and different solid tumours. Tasken group is also part of the UiO: Life Sciences convergence project on Personalised Cancer Therapies (PerCaThe). Learn more about CDSS and PerCaThe here. This placebo-controlled, double-blinded multicentre study is funded from the RCN, Cancer Society and Dept of Health with 30 mNOK and has started recruitment. The study examines the secondary preventive effect of ASA after diagnosed colorectal cancer (CRC) in patients with liver metastasis (CRCM) and recruits at five sites in Norway, four in Sweden and three in Denmark (total 2 x 400 pts recruited over 3 years). The study links to immunoregulatory effects of prostaglandin E2 (PGE2) and is based on i) our earlier findings in both primary and metastatic CTC of elevated PGE2 and suppressed anti-tumor immune responses reversible by blocking PGE2 synthesis and ii) our registry studies coupling the Norwegian cancer registry and prescription registry to look at 23,000 patients with CRC stratified on post-diagnosis ASA use and showing an HR of 0.85 (J. Clin. Oncol. 2016). A major goal of our research group is to understand the immunobiology of Treg suppression. 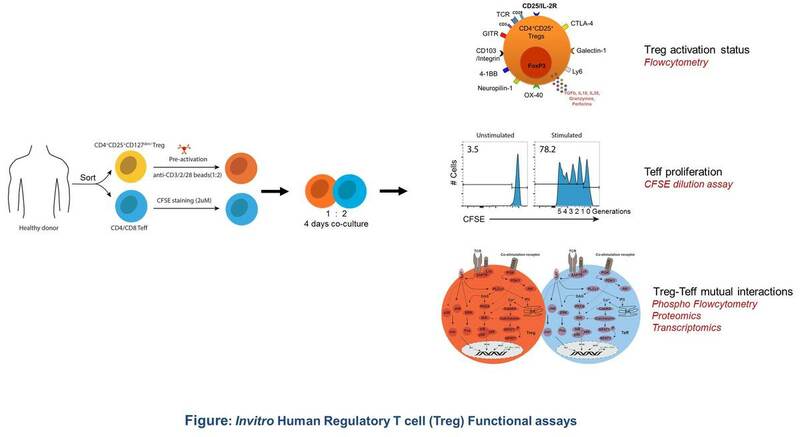 We make use healthy human donor PBMCs to study invitro how Tregs suppress CD4 and CD8 Teffs in a contact-dependent manner. Previously we have shown the importance of suppressive potency of Tregs and how Treg control the TCR signalling and susceptibility to suppression in CD4 Teffs (Chellappa et al., J Leuk Biol 2016). The current project aims to understand the mutual interactions of Tregs and CD4/8 Teffs and to decipher the contact-dependent suppression mechanisms. We use phospho-Flowcytometry, Transcriptomics and proteomic approach to study the mutual interactions between Tregs and Teffs. We are currently carrying out cell surface characterization of Tregs. Pathways that may inhibit FoxP3 upregulation and Treg activation offer a method of pharmacological intervention to downplay Treg suppression and enhance effector T cell responses. 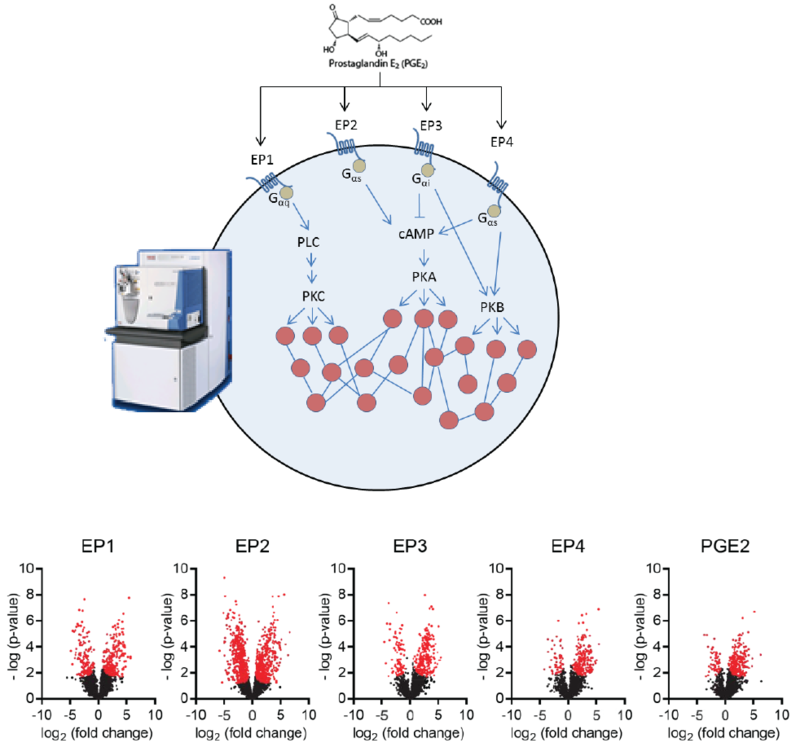 We have now developed a FoxP3 chemical biology screen by automated high-throughput flow cytometry in primary T cells and are identifying FoxP3 regulators (ongoing). The Taskén group aims to identify the role of cAMP in the regulation of T cell function and translate involvement in disease mechanisms into therapeutic strategies. We have previously mapped a regulatory pathway in T cell lipid rafts involving cAMP, PKA type I and C-terminal Src kinase (Csk) that modulates immune function. The role of PKA type I-mediated immunomodulation has now been established as a general principle in the regulation of signal transduction through antigen receptors on lymphoid cells. We have also identified Ezrin as the anchoring protein for PKA type I and demonstrated that a Cbp/PAG-EBP50-Ezrin complex provides a scaffold able to coordinate PKA phosphorylation and activation of Csk, thus inhibiting T cell activation. With the basic understanding of Tregs immune regulation, our ultimate goal is to translate the key suppressive mechanisms in cancer and autoimmune settings. Transplant surgeon Dr. Einar-Martin Aandhal has access to patient’s material from kidney, pancreas and liver transplantations. Liver transplant patient’s referred mainly due to primary sclerosing cholangitis (PSC) and hepatocellular carcinoma (HCC). We aim to compare the immune signatures between cancer setting (HCC) and autoimmune setting (PSC). We examine serum, plasma and PBMCs collected prior to the transplantation and three months, six months and one year after transplantation. We currently use multicolour flow cytometry (BD Fortessa with 4 lasers) up to 20 fluorochromes to immune-phenotype the PBMCs. To comprehensively analyse numerous surface antigen and intracellular cytokine/chemokines in a single sample, we want to use CytOF technology. The group aims to understand how specificity in cAMP signalling is maintained by the targeting and localization of different PKA isozymes and how anchoring of PKA contributes to the regulation of specific cell functions. In particular, AKAPs for PKA type I are interesting both in the context of cAMP immunomodulation and as type I PKA is implicated in mitogenic regulation. Prostaglandin E2 (PGE2) plays a crucial role in the normal physiological control of immune homeostasis, as well as in inflammation and cancer. Elevated in several cancers, PGE2 promotes tumor progression through effects on proliferation, angiogenesis and the tumor microenvironment. In particular, PGE2 promotes an immunosuppressive tumor microenvironment, partly through its actions on T cells. Four distinct PGE2 receptors (EP1-EP4) mediate PGE2 signalling in T cells, but we do not currently have a comprehensive understanding of the signalling pathways and networks resulting from this set of receptors. We are interested in characterizing these pathways and networks to gain a better understanding of the function and significance of PGE2 signalling in T cells. In addition, we are exploring ways of blocking inhibitory PGE2 pathways in T cells in order to release the immune suppression that happens in environments with high PGE2 levels, for instance in cancer. One of the major obstacle for current cancer immunotherapy is the immunosuppressive tumor microenvironment allowing tumor cells to escape immunosurveillance and anti-tumor immunity. Cancer-derived PGE2- and adenosine signaling both initiates the inhibitory PKA/cAMP pathway in effector T cells. We are thus evaluating tumor development and mechanism of the immune response in transgenic mice expressing a peptide that block this immunomodulating cAMP signaling. In addition we are investigating potential synergistic anti-tumor effects of blocking the immunomodulationg cAMP signaling with checkpoint inhibitors and CAR T cell therapy.